It's 2017. 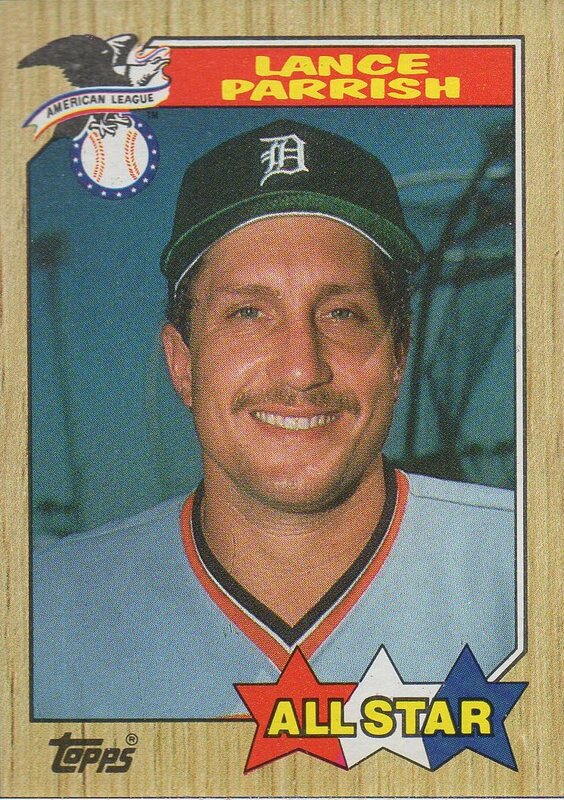 It's been 30 years since the legendary 1987 Topps set was released. 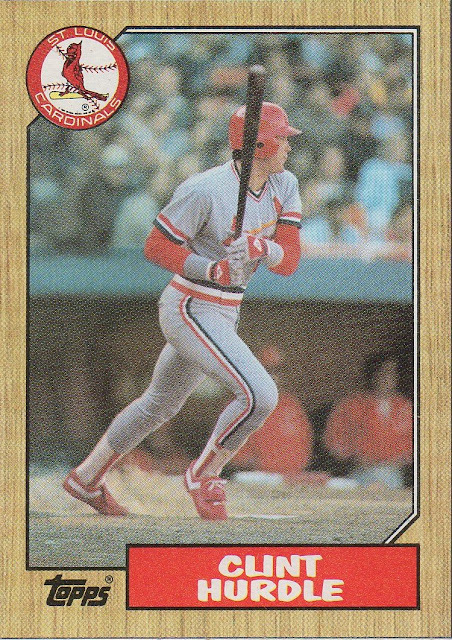 If you don't think it's legendary, then tell me why there are so many 1987 Topps themed sets that have been released the last few years. I love the set and it will always be one of my favorites. 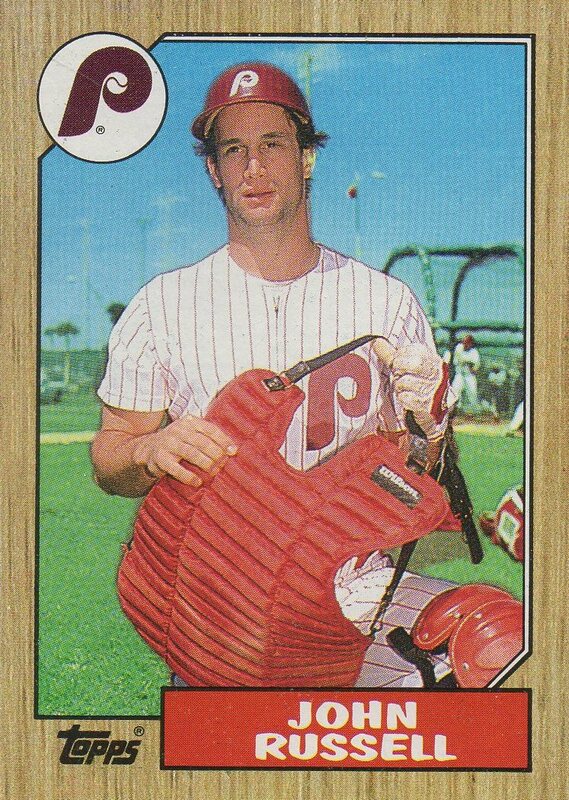 1987 was the first year that I collected trading cards, completing both the Topps and Donruss sets. During the college and post-college years, I got rid of most of my junk wax era cards. I did keep the 1986 Topps (my first cards ever), 1987 Topps and 1987 Donruss sets. Unfortunately, they were lost a little more than two years ago when my childhood home caught fire. I decided to hand-collate the 1986 and 1987 Topps sets for nostalgic purposes. Yes, I could have bought complete sets cheaper, but it's just not the same. Cheaper doesn't always mean better to me. 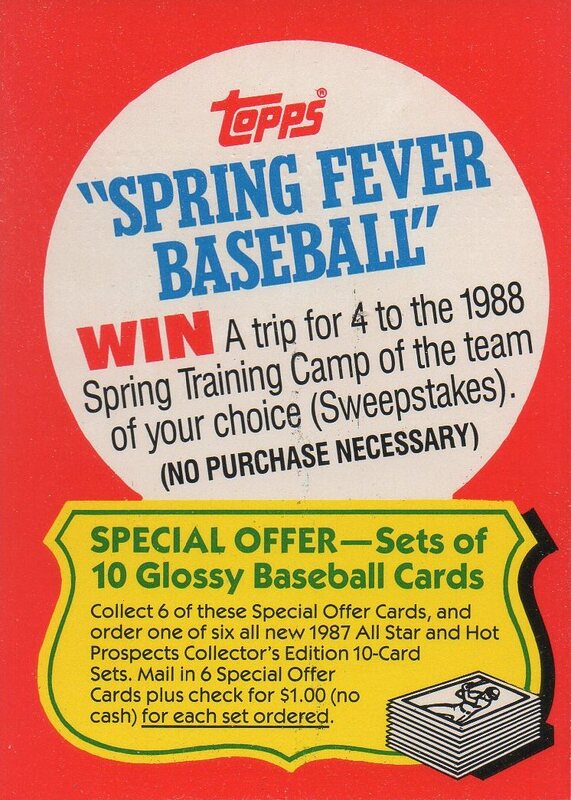 I'm almost finished with the 1986 Topps set and have a couple of 1987 Topps boxes ready to go when the time comes. 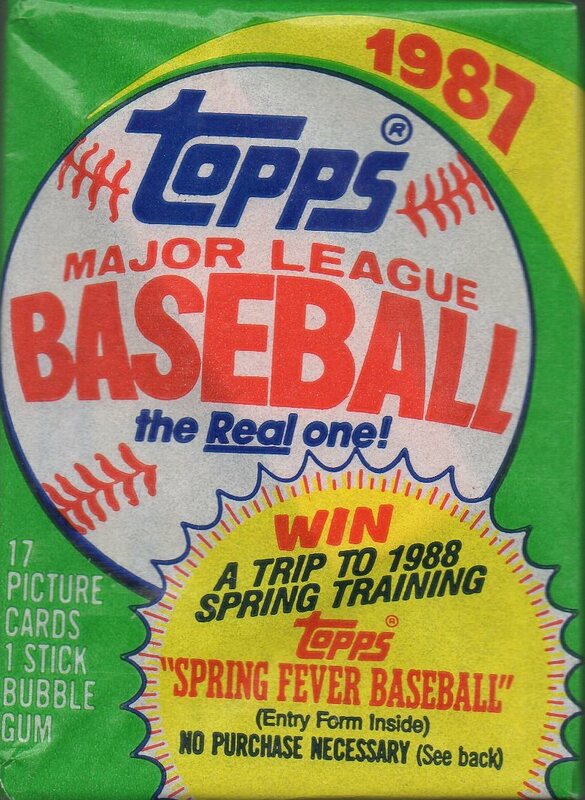 With the popularity of the 1987 Topps set, I was surprised that one hadn't been opened and posted on APTBNL. There is a cello pack post, but with the 30-year anniversary upon us, I felt many would enjoy this look. After 30 years, the gum is completely stuck to the card. I can turn it upside down and the gum doesn't fall off. To be honest, I thought the card was going to suffer paper loss as I was removing the gum. There was no way that I couldn't show the gun stain on the back of this card. 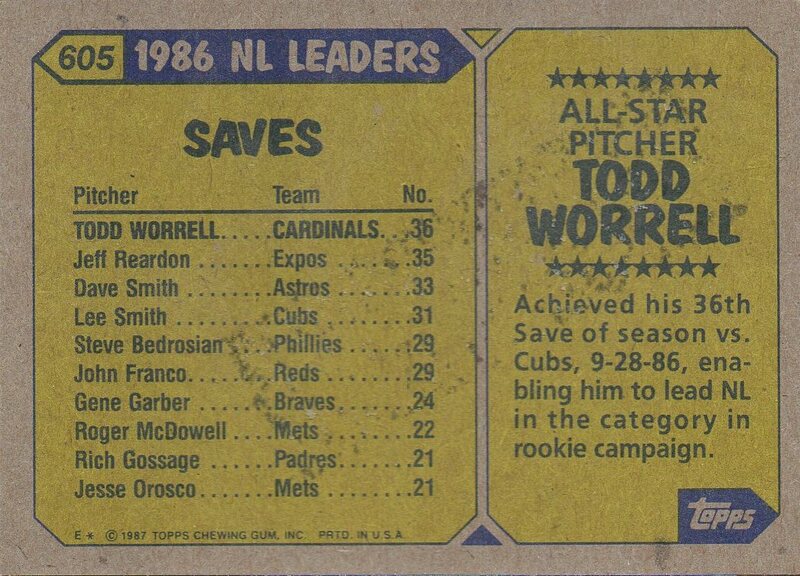 Per wikipedia (always there, sometimes accurate), Todd Worrell "is currently the pitching coach at Westminster Christian Academy in St. Louis and also coaches for the River City Rascals of the Frontier League." Lance Parrish is currently the manager of the Erie Seawolves. 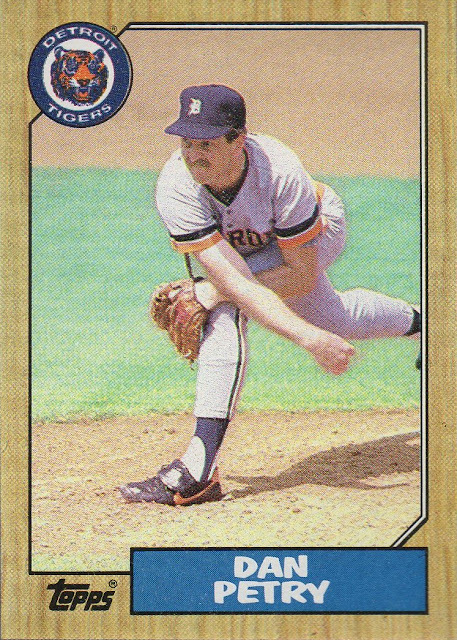 I would have loved this card in 1987. 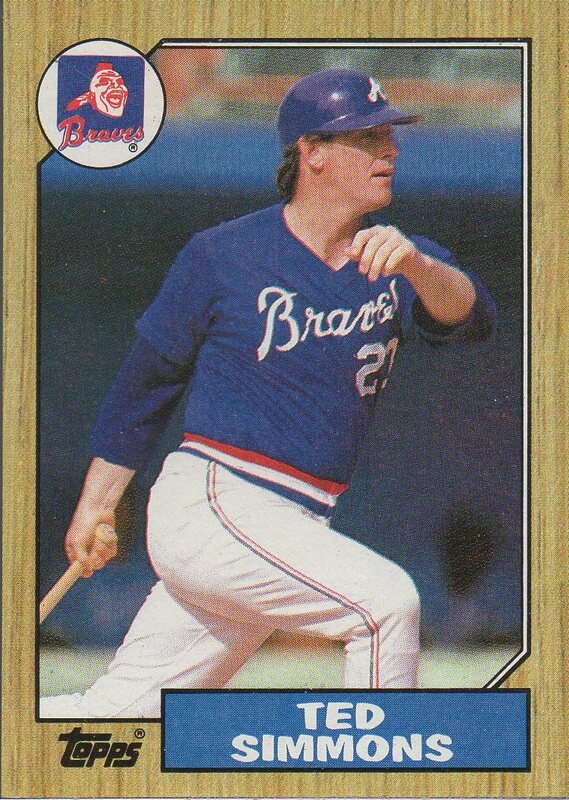 I was a Braves fan. Carl Willis is currently the pitching coach for the Boston Red Sox. 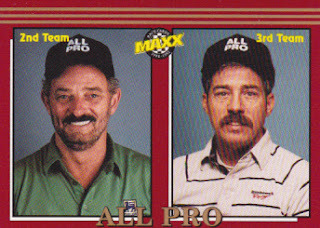 Per the Mike Morgan wikipedia page: "Morgan currently resides in Ogden, Utah and owns "World Championship Outfitters", a company which takes people on private hunts with Morgan as the guide. In 2010, he created the "Robinson's Transport Wounded Warrior Hunt", a hunting trip for military members who have received a Purple Heart. He also instructs youth baseball players one-on-one through the company "Ultimate Sports"." 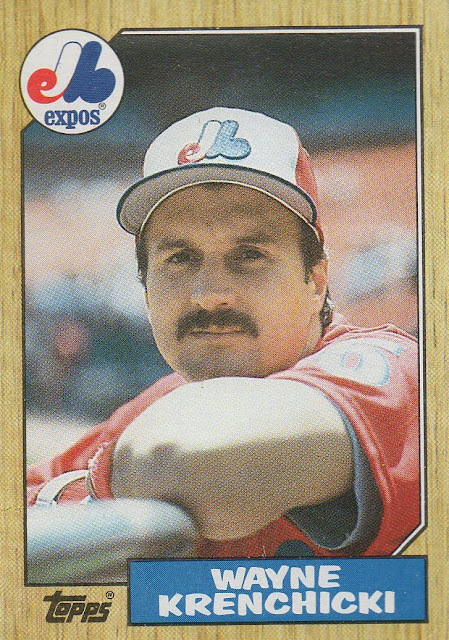 Wayne Krenchicki was the only player in the pack that I couldn't recall ever hearing of before. 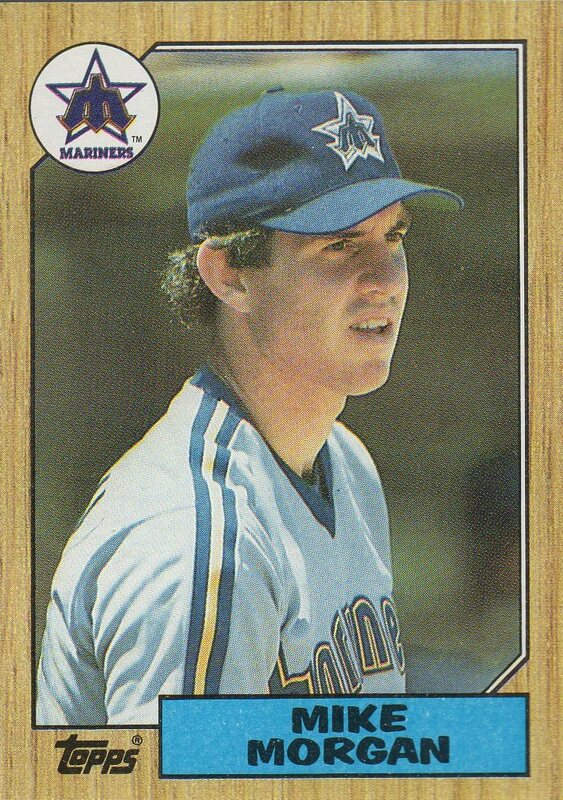 It turns out that he never played in the majors in or after 1987, which explains why. 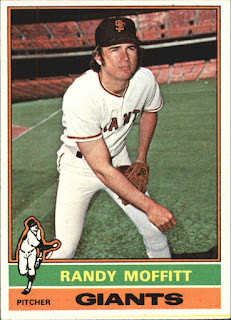 Per wikipedia: "He is currently the manager of the Evansville Otters of the independent Frontier League." Dan Petry's son, Jeff, is a defenseman for the Montreal Canadiens. 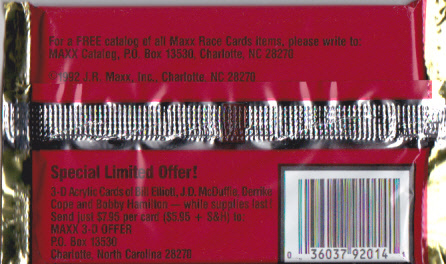 I've heard that Topps won't even honor football redemptions from 2015, so I doubt they will honor this. 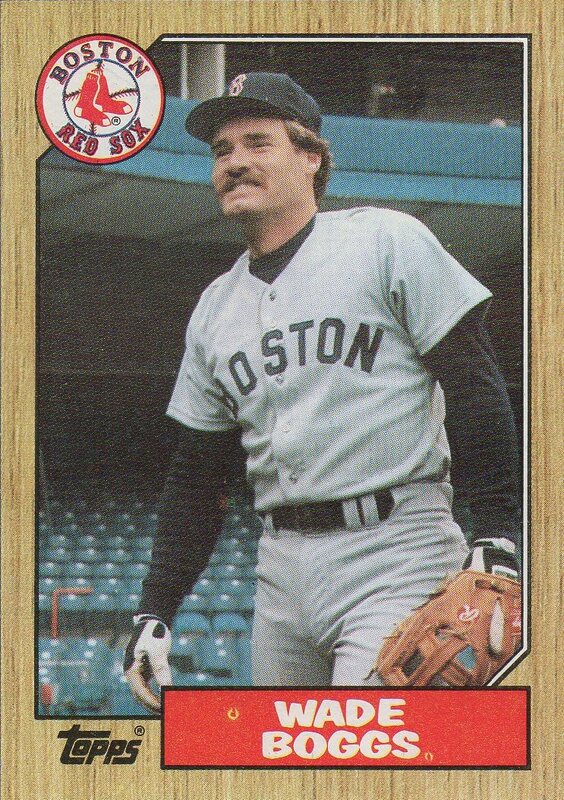 Did you know that Wade Boggs credits Mr. Perfect for saving his life in 2001? "Wade Boggs met Curt Hennig, better known as wrestling legend Mr. Perfect in 1983 and the two became fast friends, often hunting and fishing together. In fact, during a hunting trip in 2001 Hennig saves Boggs’ life. While deep in the woods, Boggs became entangled in a barbed wire fence, which badly lacerated his leg and rendered him unable to walk. Boggs rushed to his friend’s aide and untangled him from the fence, then carried Boggs over a mile through the thick brush to their truck and transported him to a nearby hospital for treatment. Boggs likely would have bled out and died from his injuries had Hennig not been with him and acted so heroically. Sadly Hennig died of a cocaine overdose on February 10th 2003, and was posthumously inducted into the WWE Hall of Fame in 2007 by his friend Wade Boggs." via sportsmasher.com. 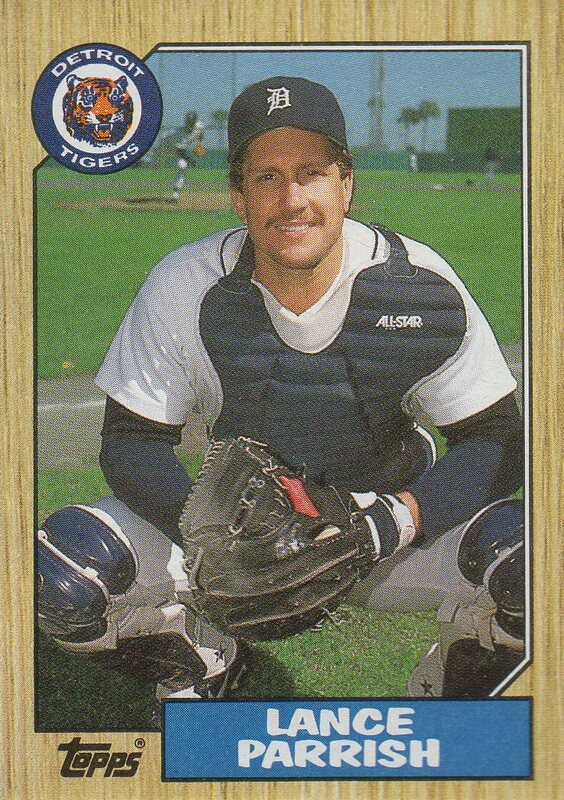 The Boggs card was easily the best card in the pack. 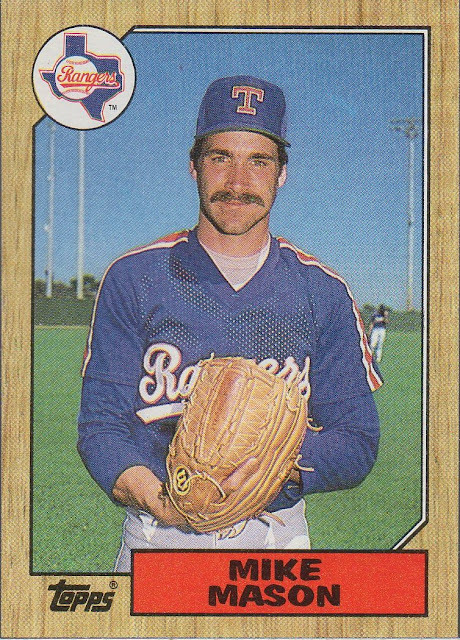 Mike Mason will be the Chicago Cubs minor league assistant pitching coordinator in 2017. From chicagocubsonline.com: "Mike Mason begins his fourth season as assistant pitching coordinator after spending the previous six years as Triple-A Iowa’s pitching coach. He has 25 years of coaching experience following a seven-year big league playing career with Texas (1982-87), the Cubs (1987) and Minnesota (1988). Prior to joining the Cubs, he served as Kansas City’s minor league pitching coordinator (2004-07), while also handling interim pitching coach duties at the Major League level in 2004. 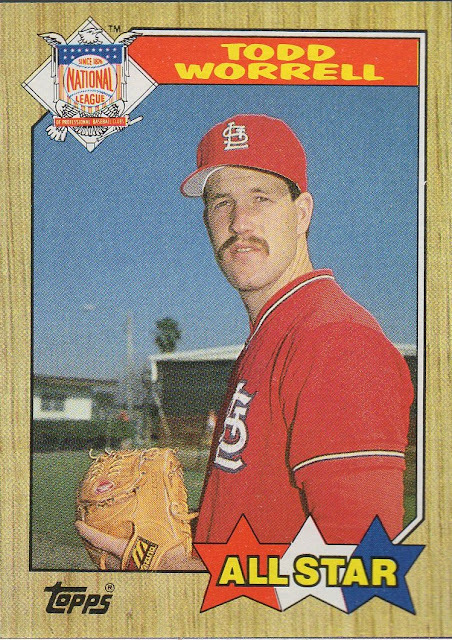 Mason served as pitching coach for Philadelphia’s Triple-A Scranton/Wilkes-Barre club in 2002-03 after serving as Kansas City’s minor league pitching instructor the previous two seasons (2000-01). 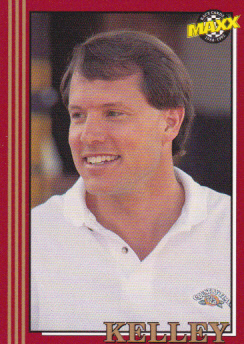 He began his coaching career in Kansas City’s minor league system from 1991-99." 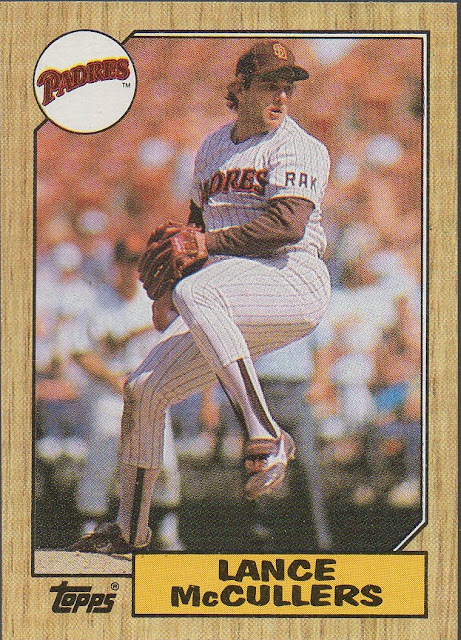 Alan Ashby loved this card so much that he had the highest home run total of his career (14) in 1987. 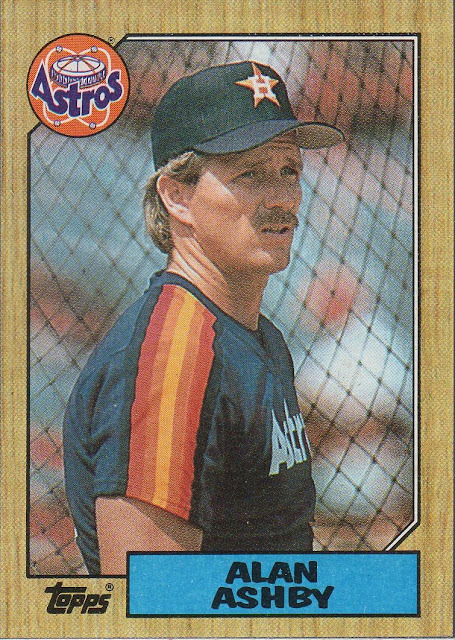 Ashby was the lead color commentator for the Houston Astros until the end of the season. I can't find if he's taken a new job for this season. 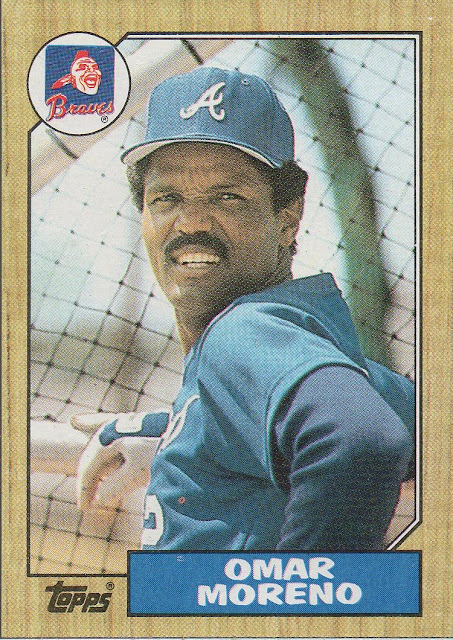 Ron Washington managed the Texas Rangers from 2004-2014 and is currently the third base coach for the Atlanta Braves. John Russell managed the Pirates from 2008-2010 and has been the Orioles bench coach since 2011. I swear that the Russell and Clint Hurdle were back-to-back. 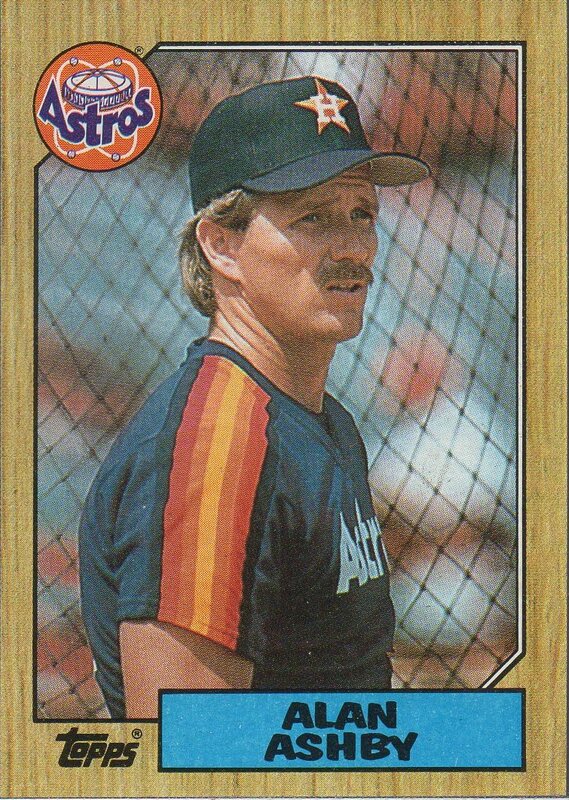 After Russell was fired, Hurdle was hired as the Pirates manager. 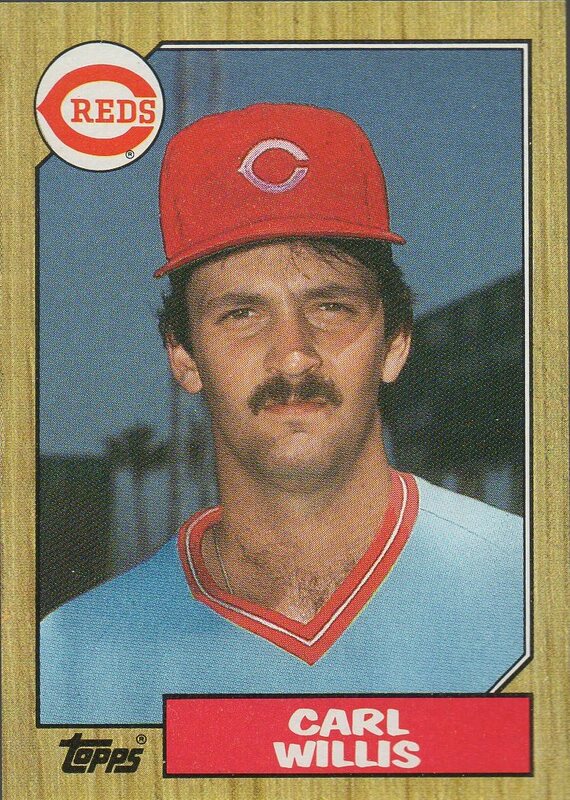 He was named National League Manager of the Year in 2013. I can't find anything on what Lance McCullers did after his playing career ended, other than be a dad. His son, Lance, is a pitcher with the Houston Astros. 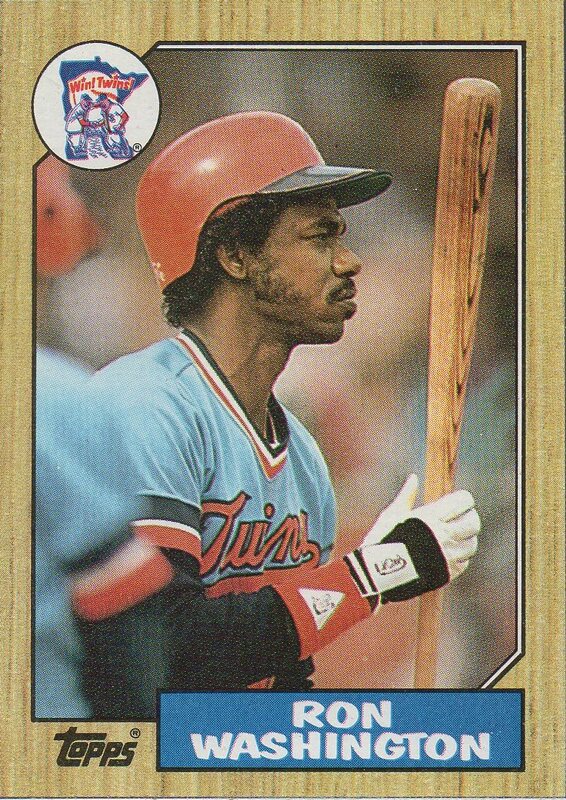 Ted Simmons had a 21-year major league career, finishing with 2456 hits, 248 homers and a .285 batting average. 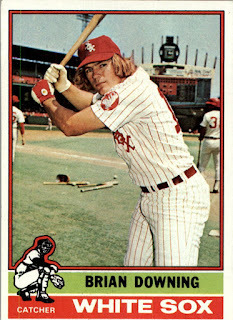 He is a borderline Hall-of-Famer, but is not in. If you just search "Ted Simmons" on the interwebz, the first page has three articles about why he should be in the Hall of Fame. He has remained in baseball since his career ended and currently works for the Braves. BRAVES HOT PACK! I would have loved this pack in 1987. Also, I had to show off the wax stain. 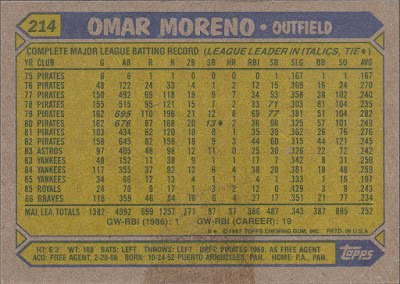 Omar Moreno is the final player in the pack and the second one that didn't play in the majors in 1987. Per wikipedia, "Moreno has returned to Panama since his retirement. 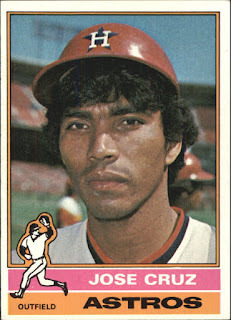 He and his wife Sandra have run the Omar Moreno Foundation, a youth baseball charity for underprivileged kids in Panama. Moreno assumed the title of Secretary of Sports, a position created by then-President-elect Ricardo Martinelli in May 2009." It's difficult for me, as a card collector, to walk into a card shop and out empty-handed. It does happen, but not too often. Such was the case a few days ago, when I saw these packs in my local shop at 3/$10. 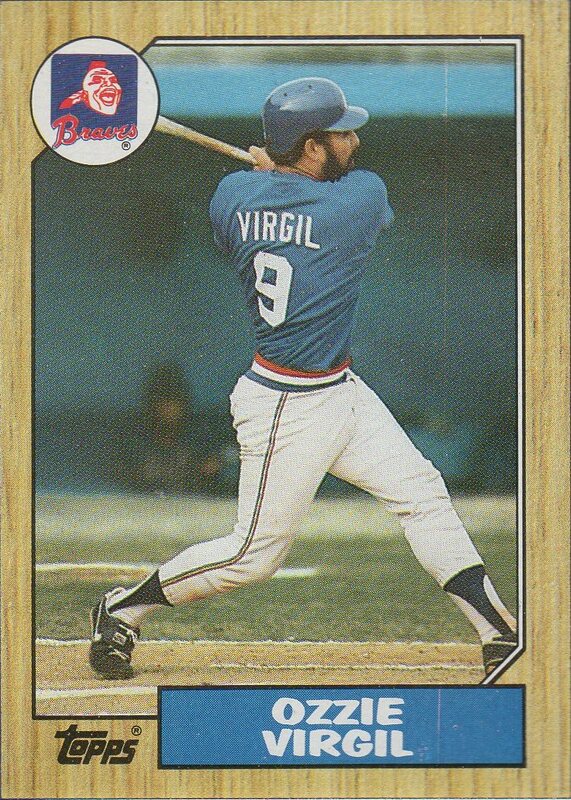 Despite not being into baseball anymore, I have always loved Heritage. 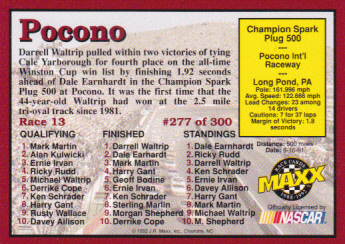 Looking through the simplistic design and pictures on these cards reminds me why. 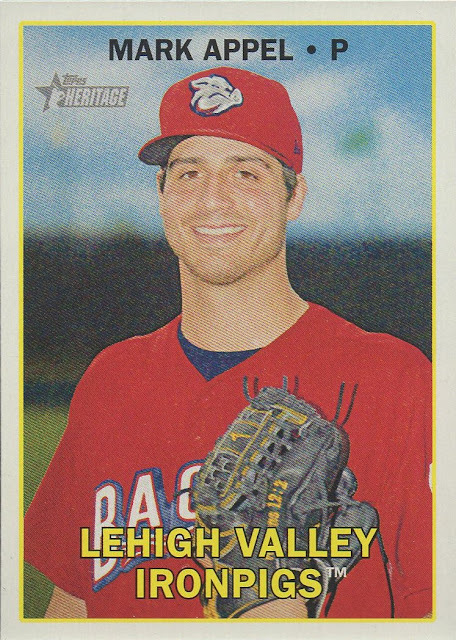 Mark Appel was the number one overall pick by the Houston Astros in the 2013 Major League Baseball Draft. 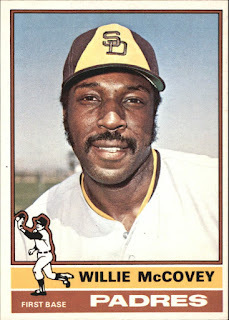 He was selected eighth overall the year prior by the Pittsburgh Pirates but elected to return for his senior season at Stanford. In 2016 he suffered injuries to both his elbow and shoulder. After the season, the Phillies added him to their 40-man roster. Despite the 5-10 record and 3.99 ERA in 2016, Jacob Faria is the #8 Tampa Bay Rays prospect for 2017, per Baseball America. 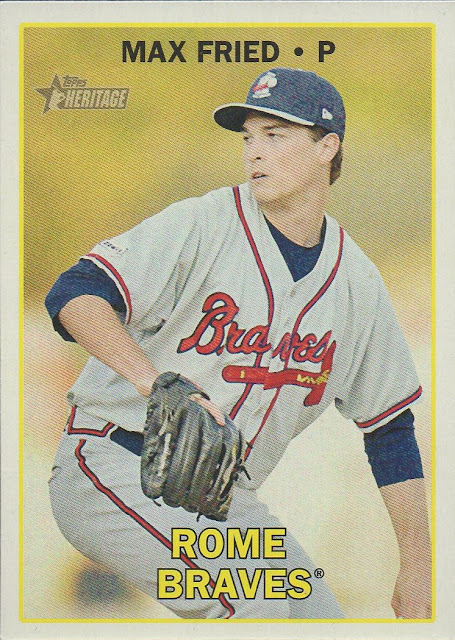 The Atlanta Braves acquired Max Fried from San Diego in the Justin Upton trade. 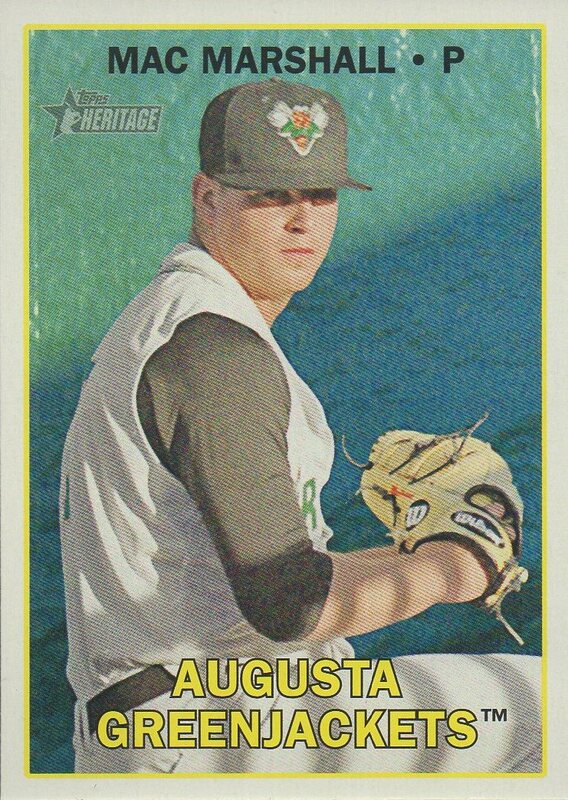 He is Baseball America's 2017 Atlanta Braves 2017 #10 Prospect. Despite not yet pitching above Single-A, he is attending Braves' camp this spring. As I said earlier, I don't follow baseball much anymore. However, I am in the hobby enough that I knew immediately that Ozzie Albies is a top prospect. 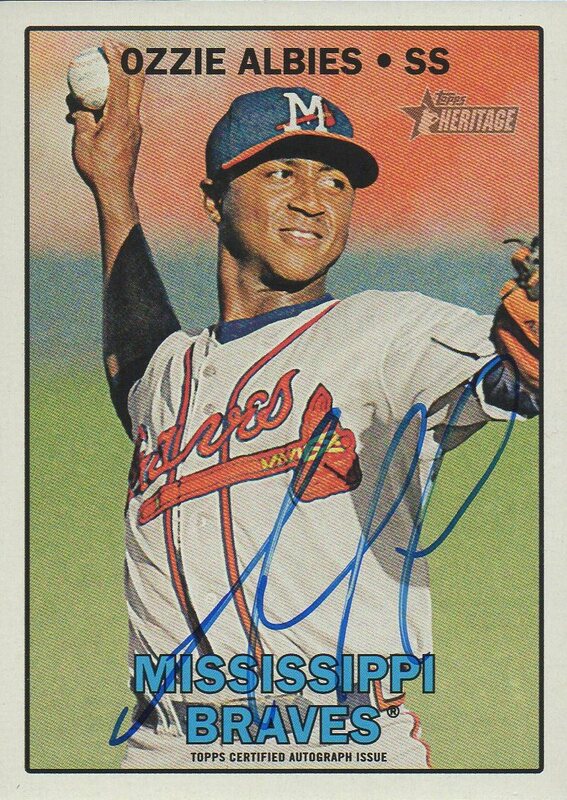 For 2017, he is the Braves' #2 Prospect, per Baseball America. He is also #11 in on Baseball America's Top 100. LINK: With Brandon Phillips, Braves can delay Ozzie Albies’ arrival, but for how long? 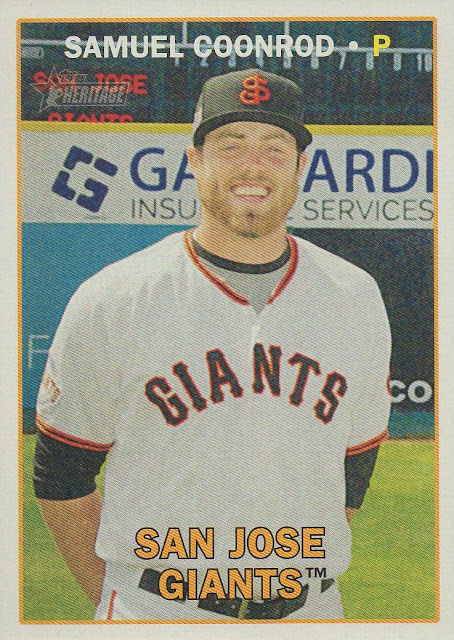 Mac Marshall was a fourth-round selection by the Giants in the 2015 draft. Since turning pro, Marshall has experienced difficulty keeping the ball in the strike zone. 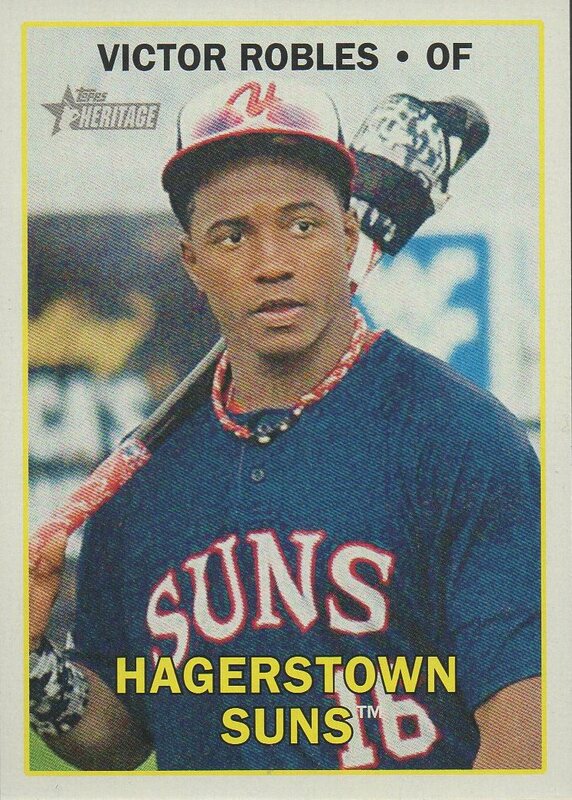 Victor Robles wasn't invited to the Washing Nationals' 2017 Spring Training camp, but he is one of the top prospects in baseball. 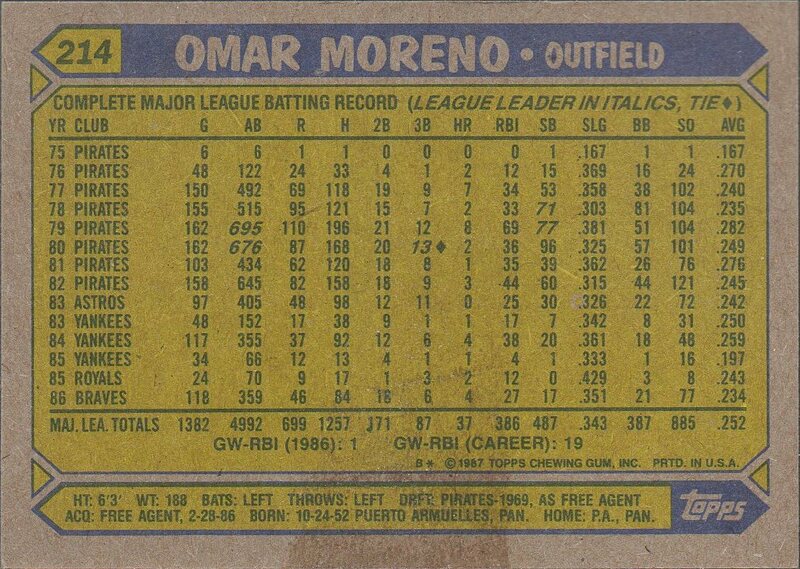 Through 218 minor league games, his career batting average is .306 and he has stolen 83 bases. Baseball America placed Robles at #13 on their 2017 Top 100 Prospects list. 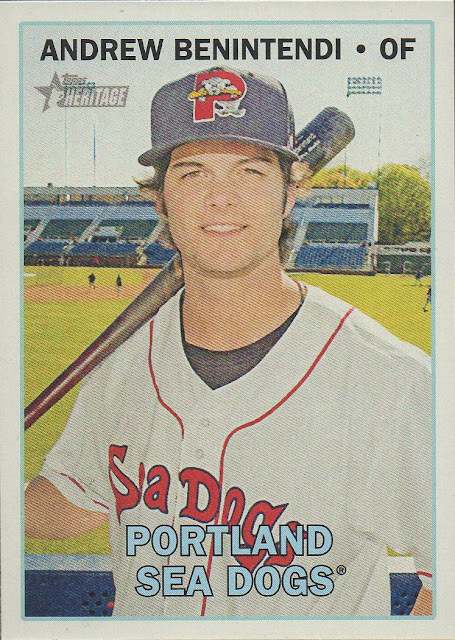 Sam Coonrod didn't make the 2017 Baseball America list of top 10 Giants prospects, but he WAS #6 on the 2016 list. 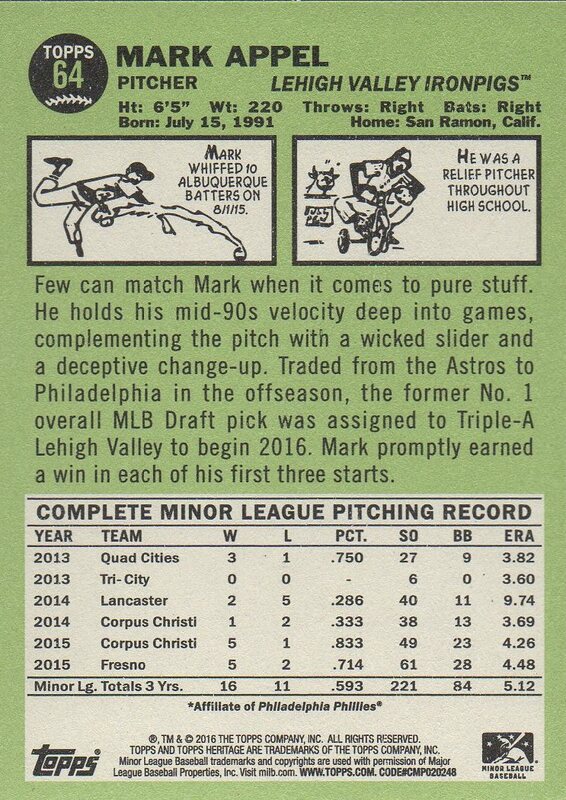 He had a 9-6 record and 2.55 ERA in a 2016 season split between Single and Double-A. 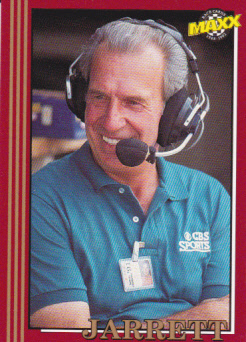 The final card in the pack pictures the only player in it to already receive "the call." If you're reading this, you already know who he is and there's no need for me to go into detail. Please take a look at my personal blog, I Feel Like A Collector Again, and follow if you're interested. I tend to focus mostly on hockey, wrestling and auto racing. 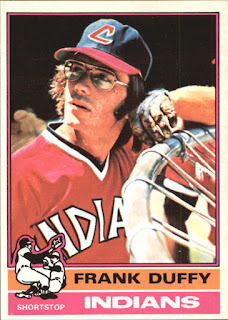 You can follow me on twitter at @beansbcardblog. I hope that you enjoyed the read. You can follow APTBNL on twitter at @namedlater. 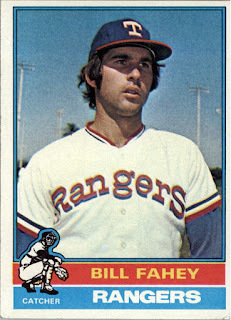 The 1976 Topps baseball set was the first set I bought complete. It sold for $9.99. 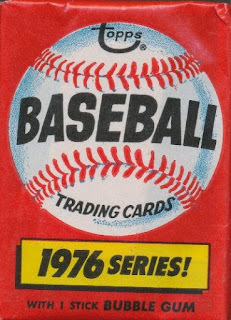 It was cool to have the whole set, but I must admit, some of the fun of collecting was gone with that single purchase. Printed in a single series, the 660 card set was sold in ten-card packs. Later in the season, packs had random inserts of "traded" cards for players who changed teams too late for the original print run. 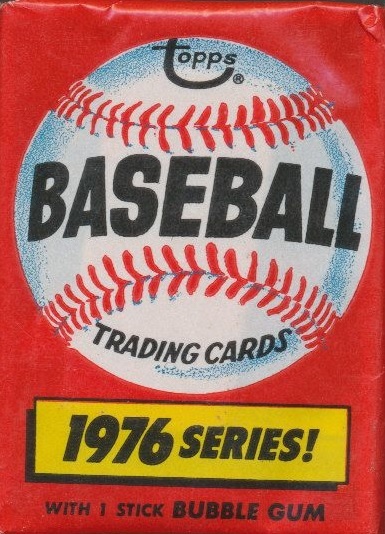 The "Traded" set consisted of 44 cards. Longtime backup catcher Bill Fahey was in the early part of his 11 year career. 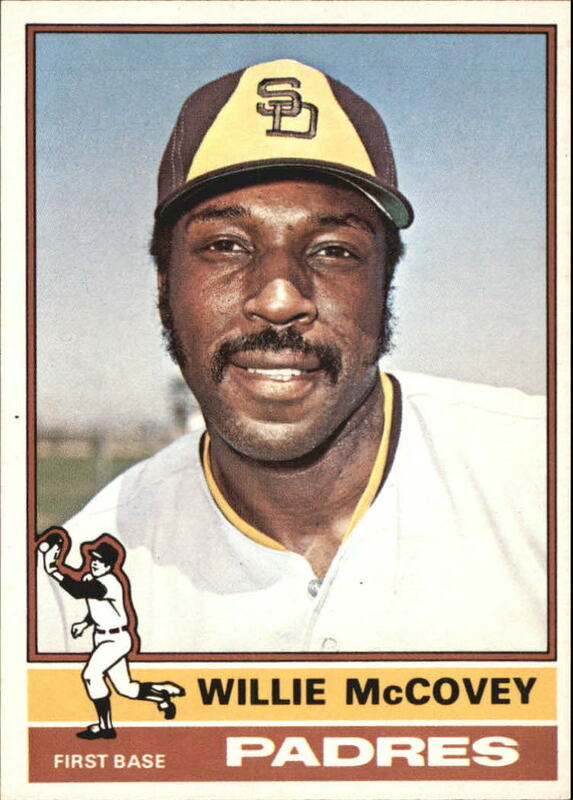 Future Hall of Famer Willie McCovery never looked right in the San Diego Padres uniform, although the card color scheme worked well for the Padres. 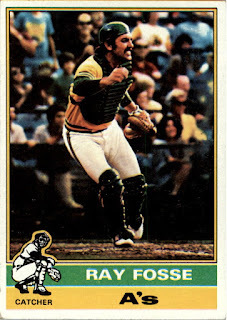 This is a great action shot of catcher Ray Fosse. 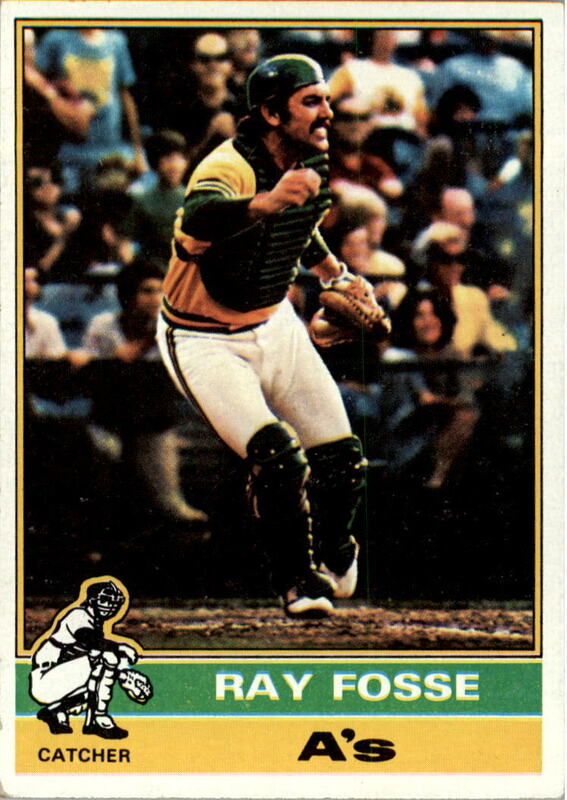 By the time this card hit the shelves, Fosse was already beginning his second stint with the Cleveland Indians and would reappear in the "Traded" set. One of my favorite cards, Brian Downing's card gives a great look at my favorite uniform with the famous Comiskey scoreboard in the background. Frank Duffy appears in a rare shot of a player around the batting cage. 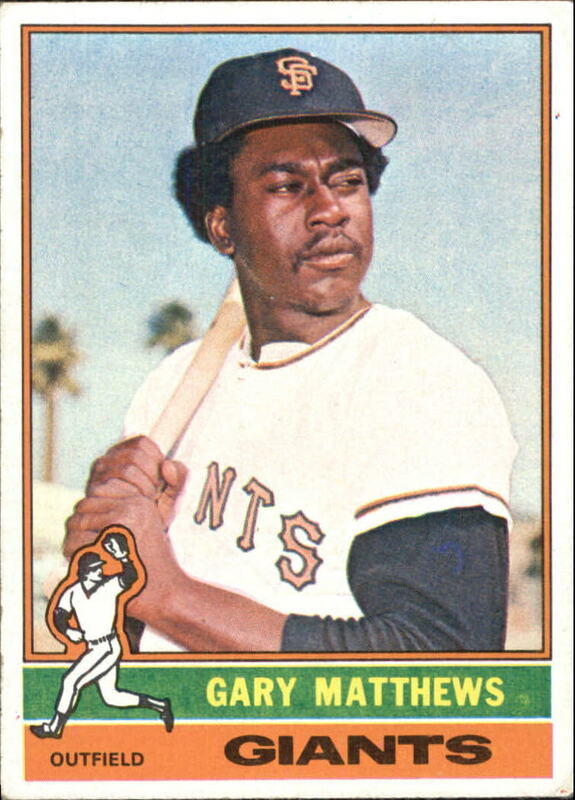 Gary Matthews strikes a nice relaxed batting pose. Long-time reliever (and brother of tennis star Billie Jean King), Randy Moffitt gives us the classic pitcher follow-through pose. 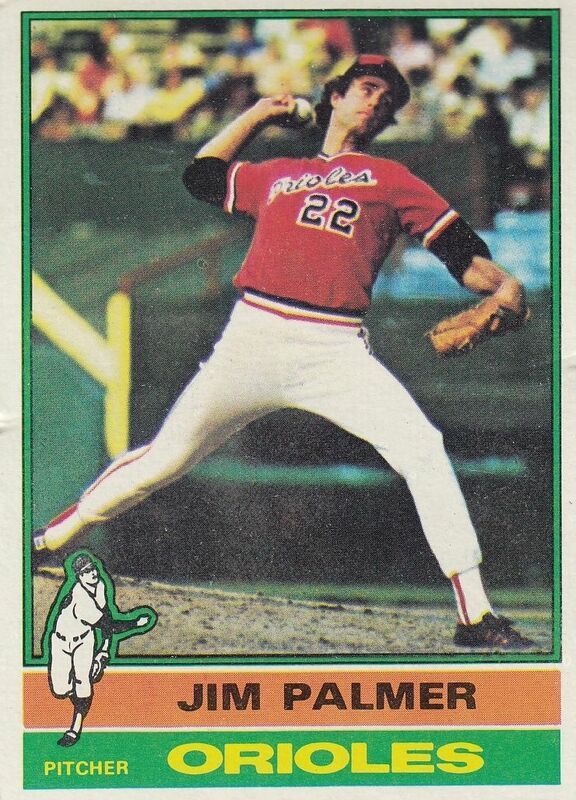 Future Hall of Famer Jim Palmer has one of the coolest in-action cards ever. 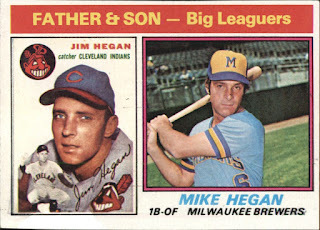 The 6 card Father-Son subset highlighted father-son combos for six players who also had solo cards in the set. It wasn't a complete "set" though, as Sam and Jerry Hairston, among others, were not represented. 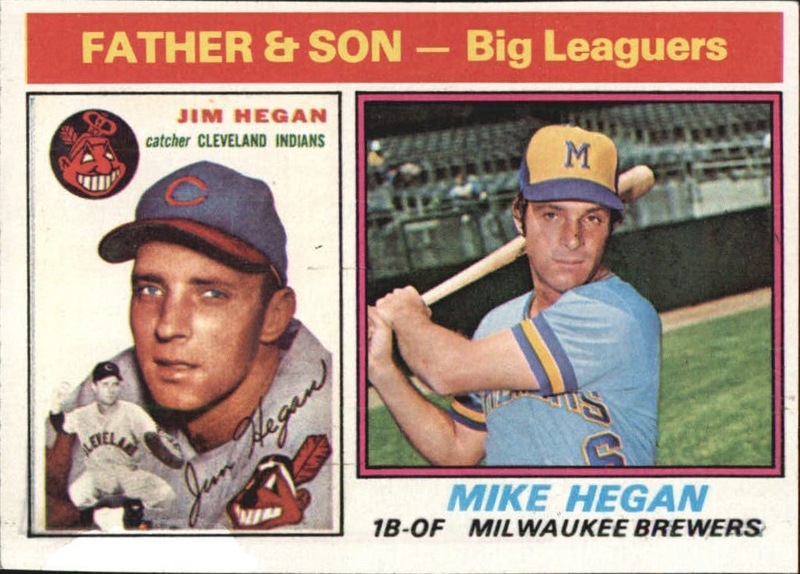 The Hegan combo combined for 29 seasons and 6 All-Star games. Jose Cruz was just starting to breakout as a star. 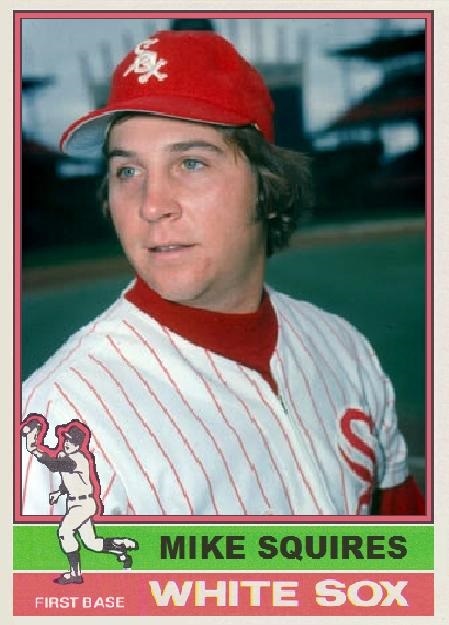 Okay, I admit, Mike Squires did not have a card in this set. 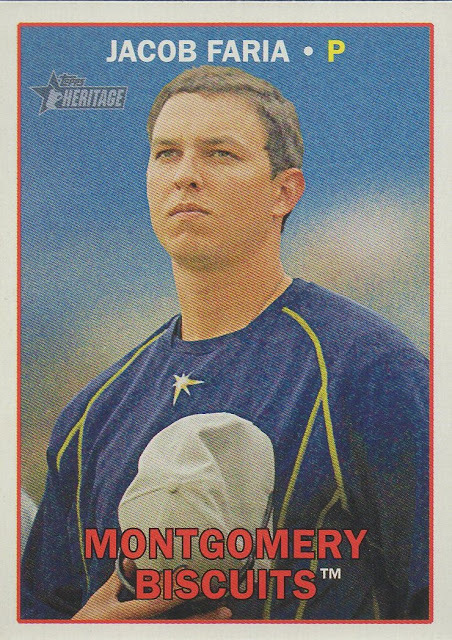 He's my favorite player though and I could not resist doing a mockup of what his card would have looked like. Maxx with their 5th NASCAR set. This set features 300 cards and 14 cards in a pack. 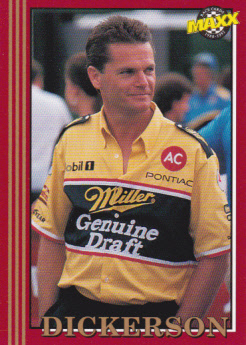 This set features Jeff Gordon rookie card. I wonder how many got those 3D acrylic cards? 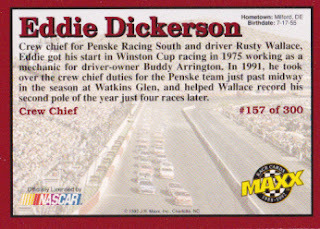 157 - Eddie Dickerson - I like the red borders on the cards. Also due to card stock the edges are prone to chipping. Shows the last name on the front then full name on the back. Even crew chiefs get a card in this set. 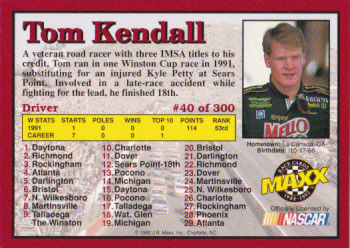 40 - Tom Kendall - former IMSA GTU champion and SCCA Trans Am champion ran only road courses in Cup series. He drove for Felix Sabates replacing Kyle Petty who broke his leg earlier in the year. He, too, would suffer leg injuries, much worse than Kyle, later in the year in IMSA race at Watkins Glen. 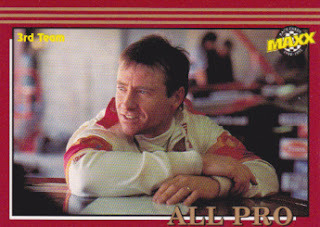 He has done racing analysts and hosted a TV show. 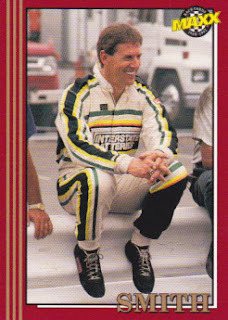 45 - Irv Hoerr - another road course specialist. 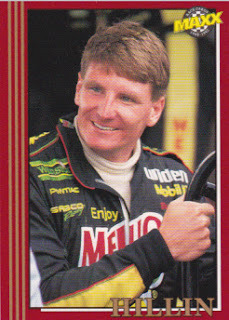 Former IMSA driver drove the only two road courses on the schedule along with his only oval race in NASCAR. 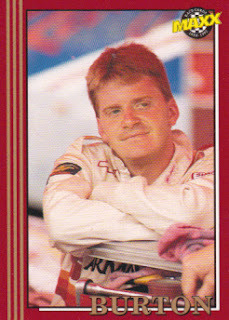 49 - Stanley Smith - had bad accident at Talladega in 1993 surviving basal skull fracture, the same head injury that killed Dale Earnhardt and Neil Bonnet. 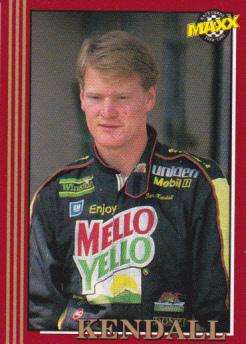 53 - Bobby Hillin, Jr. - a driver that plateau'd very quick in NASCAR. 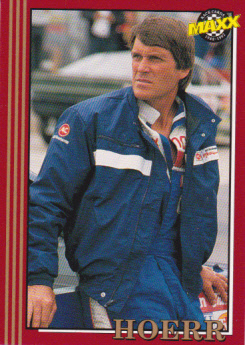 He drove for four teams that year. The one pictured was for Felix Sabates replacing injured Kyle Petty. Two years later Petty would get in Hillin face after a wreck in Daytona. 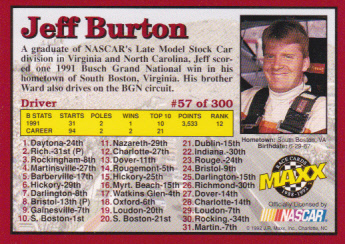 57 - Jeff Burton - racing in Grand National series during this time. He would move up few years later and become a winner in Cup series. Look at that schedule and compare it to current one. 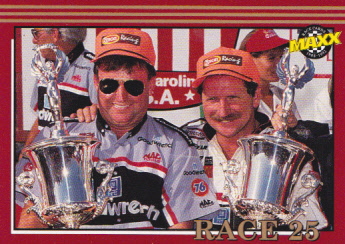 Lots of short tracks such as Barberville, Hickory, South Boston, Myrtle Beach to name a few. That what made Grand National series exciting at the time. 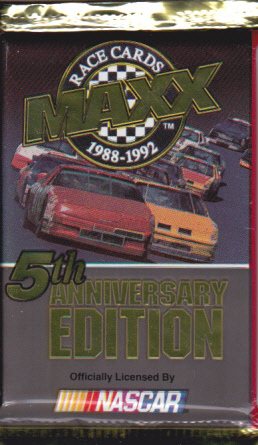 Now they race same tracks as Cup series with few non-Cup tracks races such as Iowa. 237 - Leo Jackson and Eddie Lanier - the "All-Star" card featuring NASCAR All-Pro. 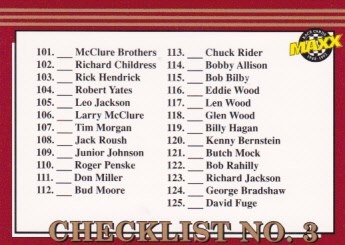 It went to drivers, owners, crew chiefs, engine builders, and tire changers. Both of them are engine builders. 221 - Ned Jarrett - NASCAR legend and champion turn broadcaster. 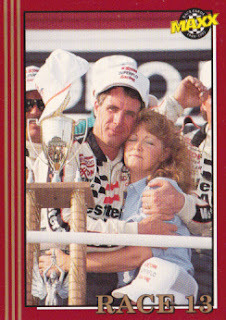 277 - Race 12 (Pocono) - DW celebrates his victory with his wife. Back of the card features the race top 10 qualifiers, finishers, and post-race point standings along post race summary. 289 - Race 25 (North Wilkesboro) - Dale Earnhardt takes victory celebrating with car owner Richard Childress. I miss good 80s and 90s NASCAR.